Technical Car Experts Answers everything you need: How to replace water pump on 1991 ford probe? 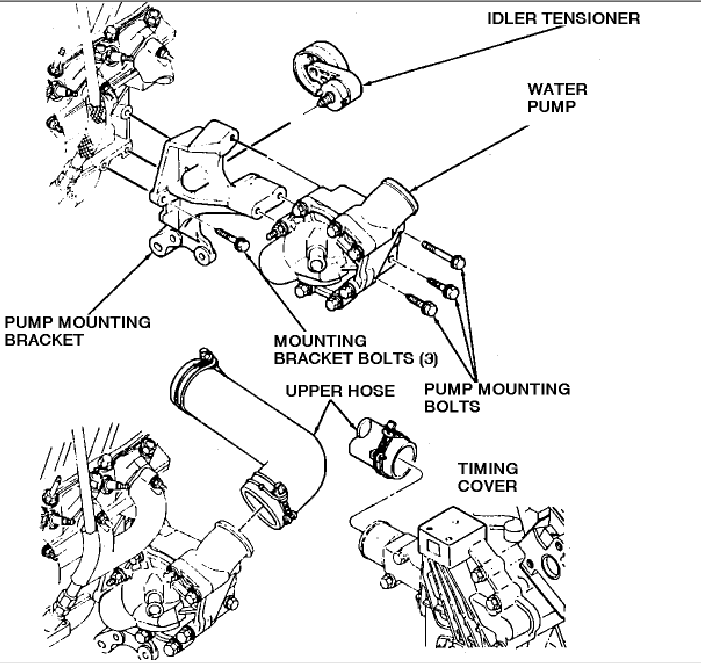 How to replace water pump on 1991 ford probe? PLEASE HELP. I WANT TO REPLACE WATER PUMP ON MY FORD PROBE. ACTUALLY I DONT KNOW.PLEASE GIVE ME FOR BOTH ENGINES. To replace water pump,you also need to remove timing belt.You dont have to replace timing belt,but you have to remove timing belt,to properly and easily access water pump. so first you read the water pump replacing procedure. Remove the timing belt. Refer to the procedure in this Section. Remove the water pump-to-engine bolts, the water pump and the O-ring. Discard the O-ring. Clean the mating surfaces of the water pump and the engine block. Install a new O-ring onto the water pump. Install the water pump and torque the bolts 14-19 ft. lbs. (19-25 Nm). Install the timing belt. Refer to the procedure in this Section. Connect the negative battery cable, start the engine and check for leaks. Check the coolant level and add coolant, as necessary. Disconnect the negative battery cable. Raise and safely support the vehicle. Drain the cooling system and remove the water pump belt. The accessory drive belt may be left installed and the pump belt pulled aside. The accessory drive belt must be removed however, if the water pump belt is to be replaced. Remove the upper water pump and heater hoses from the water pump. Remove the lower radiator hose from the water pump steel tube. Remove the steel tube brace bolt from the water pump mounting bracket. Remove the water pump mounting bolts and remove the water pump. Clean the mounting surfaces and install a new gasket. Install the water pump onto the mounting bracket and tighten the mounting bolts to 15-22 ft. lbs. (20-30 Nm). Install the steel tube brace bolt. Install the lower radiator hose on the steel tube. Install the heater and upper water pump hoses. Install the water pump belt and lower the vehicle. Connect the negative battery cable and fill the cooling system. Start the engine and check for leaks. Check the coolant level and add coolant, as necessary.